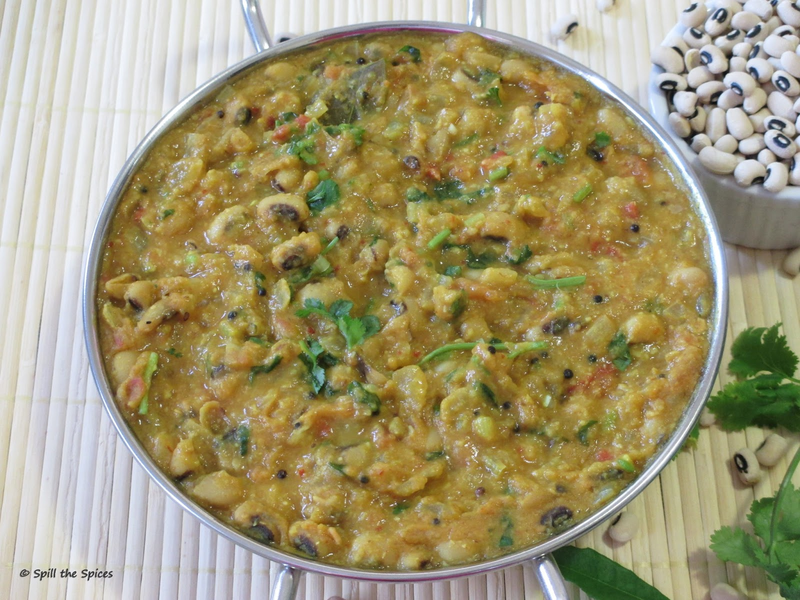 Chavli Amti is a famous Maharashtrian dish. It is prepared from black eyes peas known as lobia in Hindi, chavli or chawli in Marathi, karamani/thatta payar in Tamil. Cooked black eyes peas are simmered in a gravy of onion, tomato, coconut and a blend of fresh aromatic spices. I had a packet of this peas and was wondering how to use it up other than making sundal. I googled for recipes and found this amti recipe in many blogs. I finalized on this recipe from Tickling Palates. Serve this curry hot with a bowl of rice or any Indian flat bread. 1. Soak black eyed peas for overnight. Discard the water used for soaking and using fresh water and pressure cook for 2-3 whistles. The peas should be cooked but firm and not mushy. 2. Heat oil in pan and add all the ingredients for the masala paste. Fry them till they are lightly roasted on medium flame. When cooled down, grind to a smooth paste using little water and keep aside. 3. Heat a pan with oil. Pop mustard seeds and add hing, curry leaves and turmeric powder. Then add onions and cook till the onion turns translucent and soft. 4. Now add the tomatoes, sugar and cook till it becomes mushy. Add curry powder, ground masala paste, salt and fry for 2-3 minutes. 5. Add the cooked peas along with the water and bring to boil. Add little water if needed and simmer for 5-7 minutes. Garnish with coriander leaves. 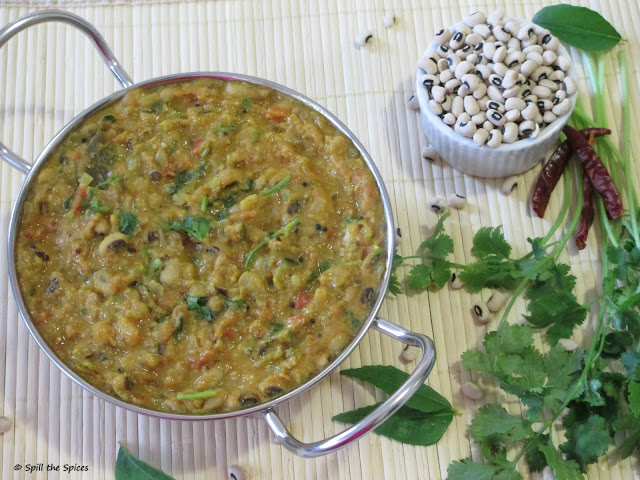 Serve hot Chawlichi Amti with rice, roti or bread. 1. You can use garam masala or even sambar powder instead of curry powder. 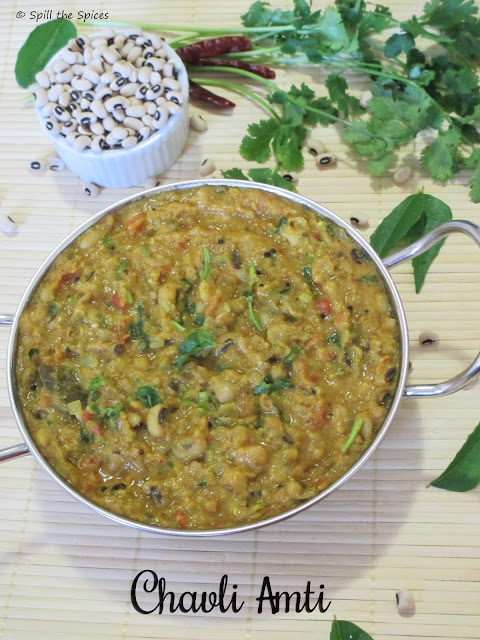 i make this curry little watery and serve with chapati.. tempting..
delicious curry, i love all lentils. must make it on the list. Look yummy! Love this with rotis! Curry looks great, am sure would taste delicious with rice.